She's a doting mum to sons Sonny, 14, Kit, nine, Ray, six, Jesse, two, and newborn Mickey. 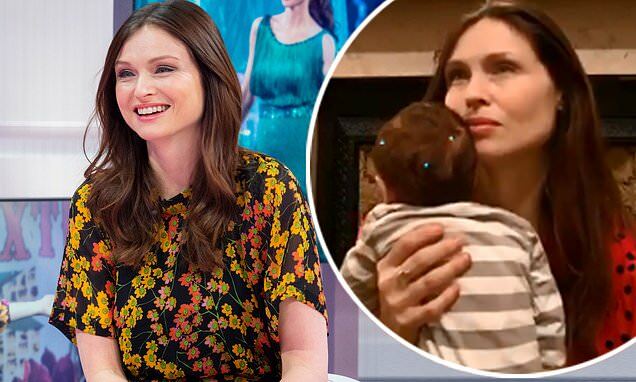 And Sophie Ellis-Bextor reflected on adjusting to life as a mother-of-five during an interview with Kate Garraway and Ben Shephard on Thursday's edition of Good Morning Britain. The 39-year-old singer, who shares her children with husband Richard Jones, enthused her household is 'happier and calmer' since welcoming her new addition ten weeks ago. Despite giving birth just two months ago, the Murder On The Dancefloor hitmaker has returned to work following the recent release on her latest album The Song Diaries. The musician discussed juggling her workload with parenthood: 'I have five children, and every time someone asks me, I always laugh! Sophie gushed over her youngest child Mickey, who she says has made her household 'happier and calmer'. The brunette shared: 'I like to think we all have a good relationships with each other. I quite like the idea that when I'm old, I'll always have men looking after me. Further into the interview, Sophie teased fans with details about her upcoming tour and new compilation album.